Unless you were there, just by looking around, it’s hard to fathom that barely two years ago the heavy rains of Tropical Storm Irene unleashed devastating floodwaters that raged through Wilmington, ravaged downtown, and left no business untouched. But many were there. That’s why, today, the town is just a bit more cheered by its abundant flowers and plants delighting from planters and window boxes throughout town, and why merchants so warmly welcome visitors into the storefronts they’ve rescued — and revitalized — from the ruins. Two years later, Wilmington continues to rebuild itself and its community economy with the help of efforts like the Wilmington Fund VT.
Their stories, and the efforts of so many affected on Aug. 28, 2011, are a testament to the resiliency of the townspeople and the fierce community spirit that some say have made Wilmington even better than before. Long before the ground was dry the volunteers came by the hundreds, said Al Wurzberger, who owns the 1836 Country Store on West Main Street. His wife, Sue, owns the historic Norton House, a quilt and fabric store, next door. The floodwaters had reached halfway up the buildings. “Everything was lost; half a million dollars lost, at least,” Al Wurzberger said. “They [the volunteers] were tall, they were short, they were skinny, they were fat, they were young, they were old. They were black, they were white, they were Catholics, agnostics, and atheists. And they argued and debated with each other as they gutted and rebuilt the Norton House and the 1836 Country Store. If it weren’t for the volunteers, none of us could have survived,” he said. Dot’s Restaurant, damage severely in the flood, but expected to reopen this fall. Everyone recalls how the Chamber of Commerce set to work matching volunteers with the many businesses that needed help digging out, cleaning off, stacking debris, rescuing what they could. Livelihoods were washed out; traditions flooded out. Meryl Streep and Tamara Kilmurray. Photo copyright Carolyn L. Bates. Every business was affected. Some 40 businesses and 100 employees were out of jobs; some 20 apartments were damaged, leaving many homeless, Manwaring says. Beyond the army of volunteers, Manwaring lauds Mount Snow, which provided temporary housing to some of those left homeless following the flood. As vital as that army of volunteers was to the cleanup effort, Dan and Tamara Kilmurray, who have owned a home in Wilmington for 10 years, and have vacationed in the area for 30, knew more had to be done — that more aid would be needed in the months and years to come. “The damage was extreme,” Dan Killmurray said. Many people had no flood insurance, and Irene had come on the heels of the recession, compounding the misery for many facing downtown’s already-boarded-up buildings. And so the Kilmurrays felt the town needed economic stimulus. Organizing a board of directors, they established the Wilmington Fund VT (www.thewilmingtonfundvt.org), aimed at supporting Wilmington’s recovery by raising funds to help repair damaged buildings and to promote commerce and business. Their tools: grants, low interest loans, real estate ownership, other investment opportunities, and partnerships with like-minded entities. Their goal was to promote job growth and economic opportunity for area residents. 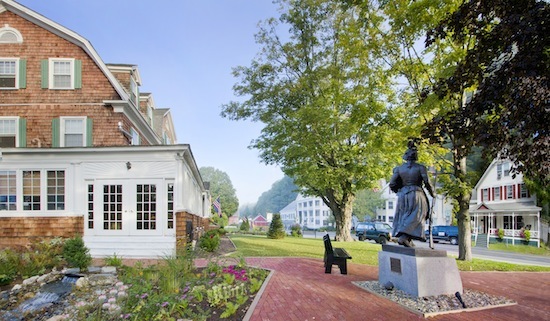 Phone calls, letters and fund-raisers — including a Joan Osborne concert and a private dinner with Meryl Streep — have enough capital to allow the Wilmington Fund VT to provide grants, help attract new businesses to town, and help build a new municipal parking lot. 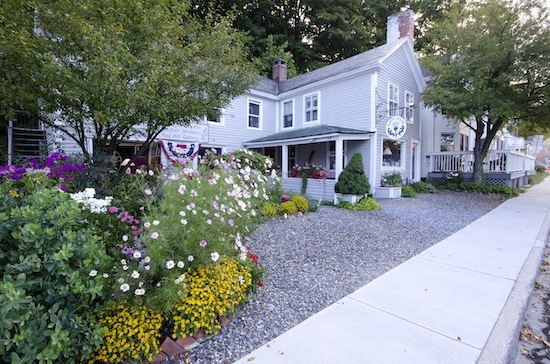 One fund-raiser last summer was dedicated to help Dot’s Restaurant recover. This popular gathering place had been severely damaged. Not to worry: an outdoor barbecue and concert netted $26,000, Kilmurray said. According to Kilmurray, the grant process requires that applicants have a business plan, a well-thought-out proposal, and startup capital. Many have donated time and money, they said, and the organization is all volunteer. “Every penny of donated money has gone into the fund to build the economy of the town. We do all the events ourselves and review the grants ourselves,” Tamara Kilmurray said. Julie Lineberger, who, with her husband, architect Joseph Cincotta of the architecture firm LineSync in Wilmington, serves on the board of directors of the Wilmington Fund VT.
Lineberger points to a renewed Main Street, and names all of its success stories, businesses returned and just starting out: Bartleby’s Books, the 1836 Country Store, the Norton House, the Incurable Romantic, Jim McGrath Gallery, Chapman’s In-Town Antiques, and more. “It’s a start,” says Lineberger, who envisions an economically viable historic district that provides full-time jobs year-round. “Through the Wilmington Fund [VT], we hope to inspire others to establish or re-establish business in the village. It takes vision, inspiration, a lot of hard work, and some capital. We need someone who’s willing to take a chance,” she says. On her wish list: a bike shop, a camera shop, and a bakery. Melinda Coombs is one of the beneficiaries of the Wilmington Fund VT. She opened Beyond Imagination, a clothing and home goods store on North Main Street last September, partially at the urging of the Kilmurrays and others who felt a boutique was needed in town after Manyu’s, a clothing store here, was wiped out by the flood. Coombs had worked at Manyu’s, and has a personal stake in the vitality of Wilmington. She’s from Wilmington, as are her grandparents, parents, child, and grandchildren. “It was not an option to just move,” she says. Len and Diane Chapman, longtime residents of Wilmington, also decided to invest in downtown, with partners David and Joann Manning and assistance from the Wilmington Fund VT.
“We had an antiques shop in a big barn [outside of town] and we were only doing weekends. The four of us got together and said, ‘Why don’t we open something in town?’” Len Chapman recalls. Chapman’s In-Town Antiques opened on West Main Street last October. In addition to providing a more visible location for their antiques business, the Chapmans said they wanted to help the town. Len Chapman has lived in Wilmington for 40 years. “The town has been good to me. I wanted to return the favor. I have great friends and neighbors here,” he said. Moving downtown has been worth the investment, he reports, and it has helped the antiques shop that’s still in the barn a few miles away. Bartleby’s Books, like its neighbors on West Main Street, suffered heavy damage from the flood. Some of her close friends, as well as customers and people they’d never met, showed up to pitch in with repairs to the building. “So many people helped! We renovated with an eye for flood mitigation and reopened three months after the flood,” she explains. And like her neighbors, she is optimistic about the future of the town. Meanwhile, folks have come together to forge a path for the future in ways that they had not considered previously. The town recently attained downtown designation status and formed a downtown organization named Wilmington Works, essentially a subcommittee of the Wilmington Fund VT and composed of 11 members representing downtown businesses, local government, and the Chamber of Commerce. This new organization will help organize and drive activities critical to making downtown Wilmington a vibrant and vital place, Sullivan predicts. Artist Ann Coleman arguably was the most dramatically affected by the storm, and her plans for a new gallery may be among the most innovative — and symbolic — of the future of Wilmington. In her art gallery on West Main Street, she showcased her own paintings and prints in addition to the work of other artists and artisans. She and her husband were finishing up renovations to the space when Irene hit. Ann Coleman Gallery was swept down the flooded Deerfield River, taking with it original paintings spanning 33 years of work, over 400 prints, and the works of the other artists. Coleman set up temporary digs at various sites in the aftermath, and last February reopened her gallery in a storefront on North Main Street. She’s contemplating building a new place where her previous gallery sat, of course. If the plans go through, the new building will float, too — it’s designed to — but it will float in place. That’s thanks to Wilmington architect Joseph Cincotta, who’s designed a structure that works with floods, like a boat dock. The building is anchored on heavy metal piers, and when the waters rise the electricity snaps off, plumbing stops up, and the structure, untroubled, bobs. Fellow artist Jim McGrath watched the storm from his nearby apartment, and painted the rain and the water rising against the buildings: another kind of landscape. He had recently closed his gallery, but had stored some 50 original paintings and his tools and paint brushes in the basement of the Parmalee and Howe building at the center of town. The basement and first floor of the brick building were flooded, and McGrath lost all his work. Today he has a gallery again, on West Main Street, and is among the many businesses along the street that are back in operation. He says he’s optimistic: Better things are in store for Wilmington. “There’s a sense that with a couple of nudges in the right direction, we’ll have something going again,” he adds. Things are already moving in that direction. Dot’s Restaurant has reopened; a sign on the historic Parmalee and Howe Building promises a new restaurant and bar; and a coffee shop — Folly Foods — has opened at 33 West Main St.
Peter Wallace, who owns Folly Foods with his wife, Kathleen, describes the place as a coffee bar, juice bar, and dairy bar. Restaurateurs on Nantucket for more than 30 years, the Wallaces sold their restaurant on the island and have become year-round Wilmington residents. Fresh-baked goods, ice cream and some retail food — such as local honey — are also offered at Folly’s Foods. Wallace says he hopes to fill the void left when a former coffee shop closed after the storm. “We’re really excited about it,” he said, explaining that he and his wife, like so many others, were inspired by the many stores that were damaged by the flood and have rebounded. “We wanted to join the community and bring it back to life. We want to encourage the future of Wilmington by helping it become the vibrant, cool place that it is,” he said. WILMINGTON — As you look down Main Street, activity is steadily building after two years since Tropical Storm Irene ruined many of the downtown businesses. On Aug. 28, at Gov. Peter Shumlin’s press conference at Memorial Hall on the day of the second anniversary, people gathered to hear the message that Vermonters had worked together to rebuild the communities that had been destroyed by Irene. One resident had remarked that the day was similar to the day after the storm: sunny with blue skies and a comfortable breeze. Together, the community is still picking up the pieces. Employees of Dot’s Restaurant, which is scheduled to open next month, handed out free bowls of their famous homemade chili. They had set up a table outside their building, which had been destroyed by Irene. A special fundraising effort called Rebuild Dot’s had assisted with costs associated with reopening its location in Wilmington. The Wilmington Fund Vermont was established by Dan and Tamara Kilmurray, two long-time second homeowners. They have worked with residents whose efforts have assisted in the funding of several projects, including the re-paving of a village parking lot. While places like Bartleby’s Bookstore and Wahoo’s Eatery had reopened almost immediately with monumental recovery efforts, there are still empty storefronts that Shumlin had noted. Since Wilmington’s village was approved for the Vermont Downtown Program, the organization Wilmington Works was created. It has worked with other groups to attempt to make use of those buildings and accomplish other goals towards restoring vibrancy. Fellow Co-Chair Lisa Sullivan spoke of how the community was back to work putting itself back together. She mentioned the long term recovery efforts that several residents are enthusiastic about. State Treasurer Beth Pearce briefly mentioned the story of how Wilmington Town Clerk Susie Haughwout saved important records of the town. Her car was destroyed on Main Street due to the flooding that occurred after she rescued the documents. Haughwout’s most recent efforts have been focused on making all the town records digital to prevent the risk of destruction. “This is a success story that came out of Wilmington,” Pearce said of the town’s recovery efforts. Murphy told the Reformer that there were still at least a couple of people waiting on buyout programs to be completed. But as far as a municipality, the Whites Road Bridge is the final recovery project for the town. It is slated to be done by the end of September. “We’re happy to be done with Irene and looking forward to moving forward,” he said. State Sen. Bob Hartwell weighed in on the efforts as well. He has lived in Wilmington since the middle of April. “Based on what we see, I think we’re going to go a very far way,” Hartwell concluded.